The present-day Louvre has been the result of a series of successive building projects completed over the past 800 years. (Wikipedia page). 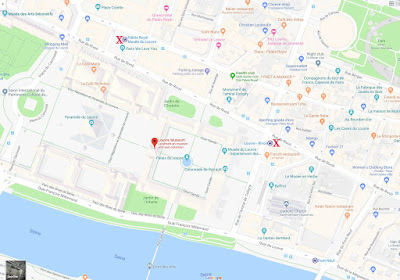 It is located on the Right Bank in the 1er arrondissement between the Rue de Rivoli and the Seine River, the same river that flows to where the Eiffel tower is. 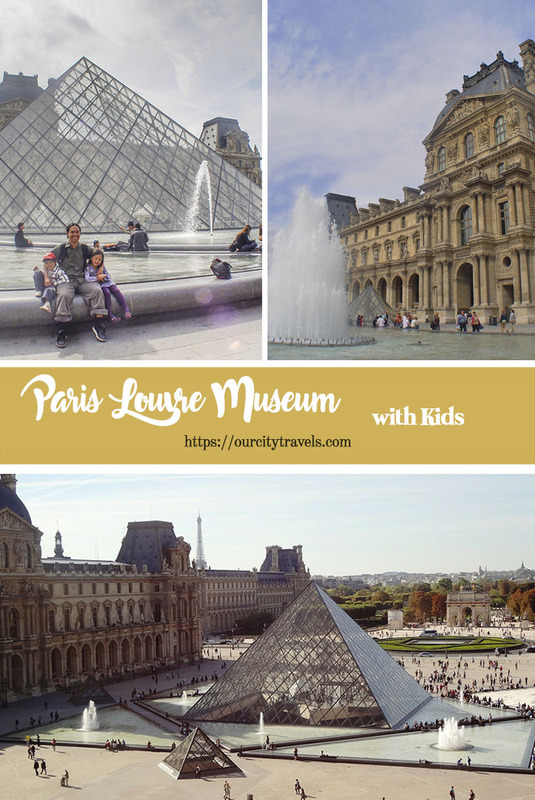 Home to many notable works of art and perhaps the most visited museum in the world, the Louvre used to be a palace under the reign of Philip II. Click to enlarge (opens in new window). We arrived in Paris coming from Marne La Vallee via RER at the Opera Station. 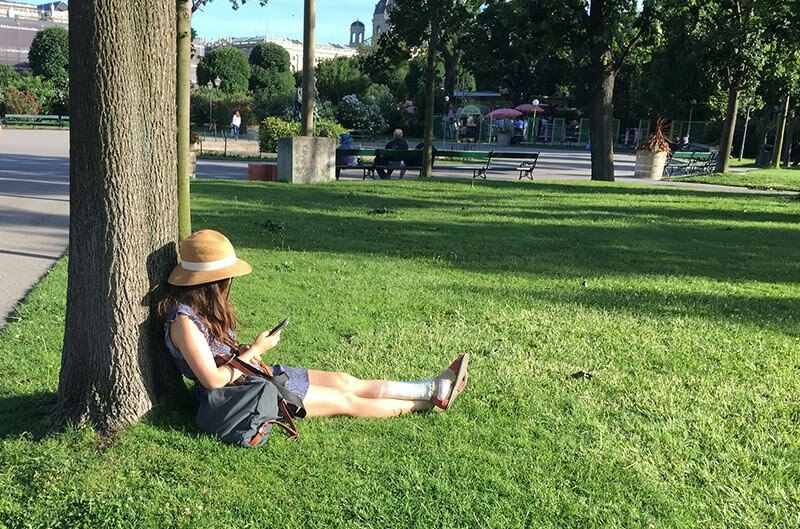 We transferred to Line 1 and alighted at Palais Royal Musée du Louvre. Hubby brought his navigator so it didn’t take us much time to find the museum. We had some photo op on the way, which I will upload in the following posts. 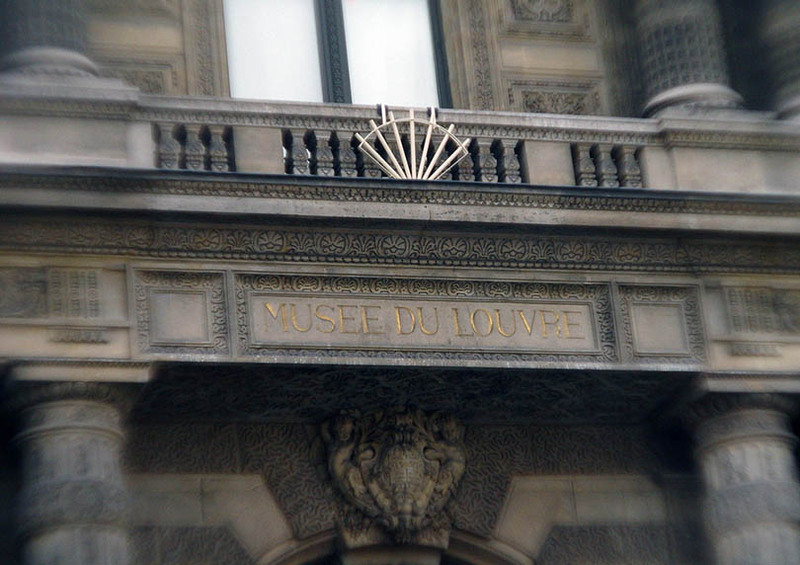 The closest Paris Metro stations to the Louvre Museum are Louvre Rivoli and Palais Royal Musée du Louvre. These are both on Line 1 which travels underneath Rue de Rivoli. 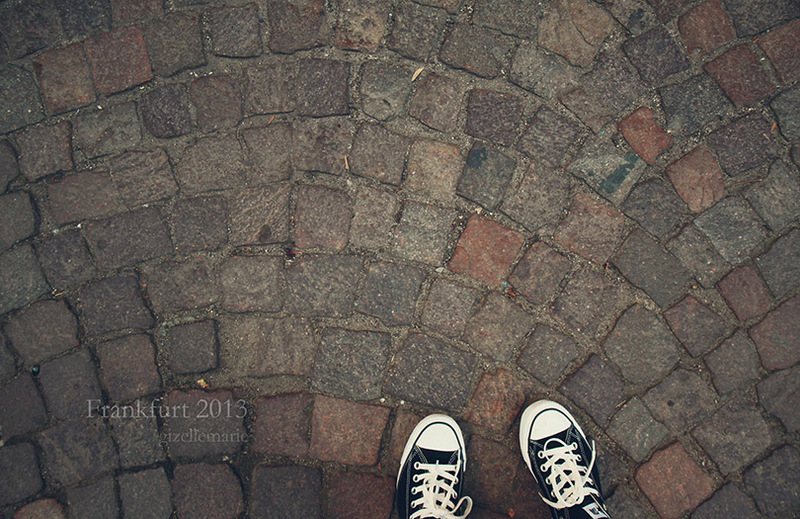 And while walking to the Louvre, we discussed how it is correctly pronounced. Loov? Louv-reh? Louver? Well it’s Loov (English) and Loov – ruh (French). ^An antique dealer’s shop opposite the Louvre. We were quite ecstatic seeing this, we actually thought that this is the musem. lol. 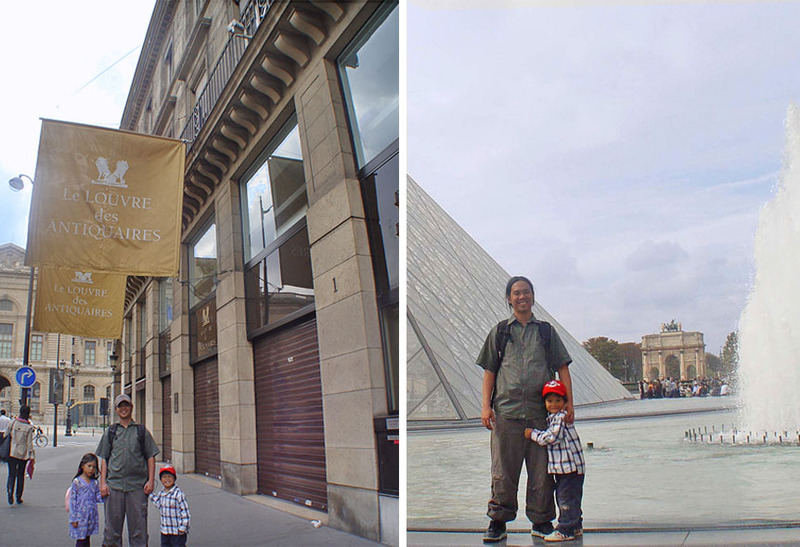 That’s hubby and son #1 by the Louvre’s (Half) Pyramid at the courtyard. The pyramid is the main entrance to the Louvre itself. The main lobby is actually below the ground. Walking a bit further and to the front of the antique shop is a courtyard, turns out that is the French consulate. Opposite is the entrance to the Louvre. 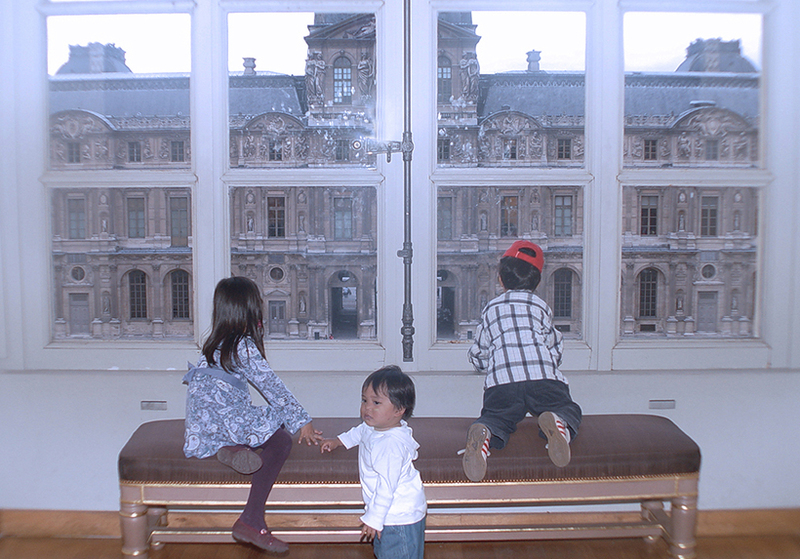 Book Your Louvre 2-Hour Private Tour for Families&Kids. The museum is free for children under 18 years of age. 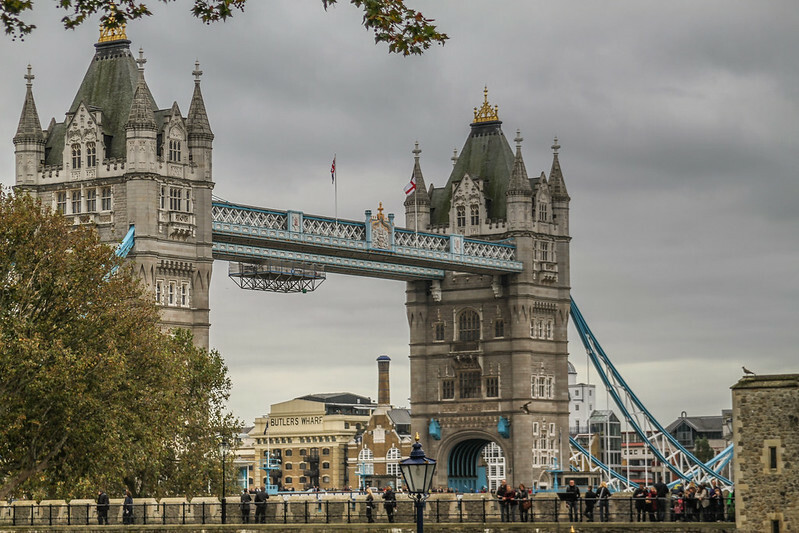 It is also free for adults from the European Union under 26, just show an ID when you enter. It is not a surprise to find a long queue when you get to the pyramid, as mentioned, the main lobby is located there. 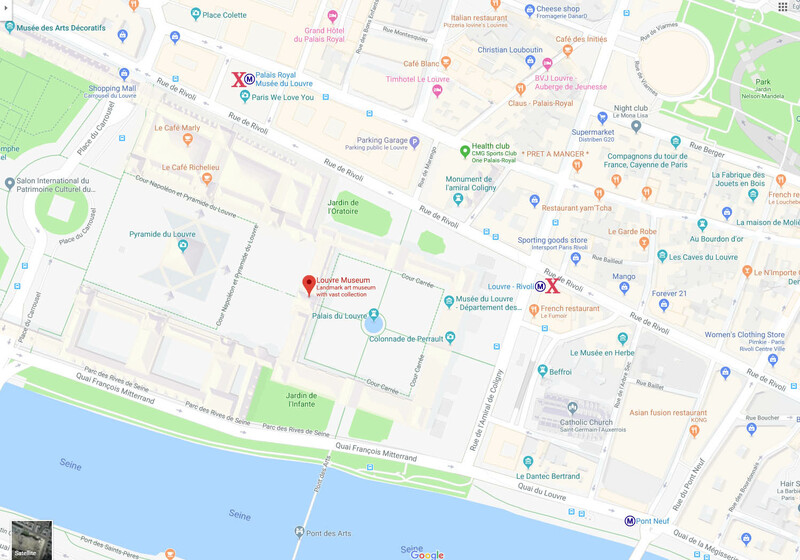 Thus, we recommend entering through either the entrance at Palais Royal-Musée du Louvre metro station, or at the 99, Rivoli Street. If you opt for a guided tour, make sure to clear out with the guide where you should meet up/start. Cooperate with the security personnel once you get in. This will make things easier for you and other patrons or art enthusiasts. ^View from inside the pyramid, though this is when were going up already. Escalators and elevators are available for use. One could just be awed at the magnificence of this vast infrastructure whether inside or outside. 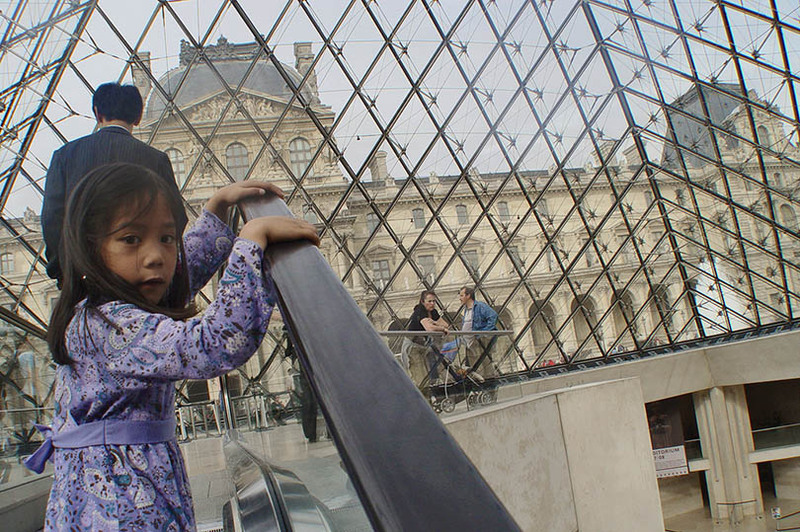 The Louvre is definitely one of our favorite museums. 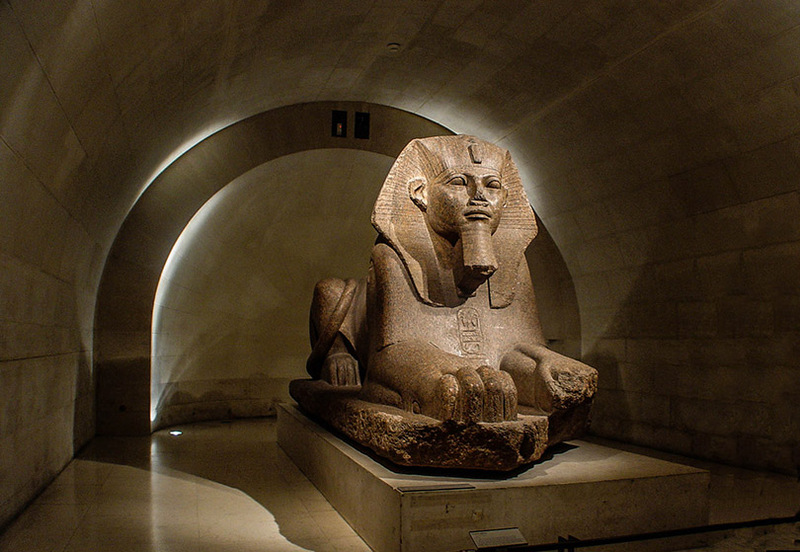 This is one of the largest sphinxes outside of Egypt. According to archaeologists, certain details suggest that this sphinx dates to an earlier period – the Old Kingdom (c. 2600 BC). A severed head. Either the parts were lost or the sculptor intended it that way, since during that certain era, sculptors would make less visible parts of statues, also body parts are made separately then assembled together. Hubby posed beside almost every statue. 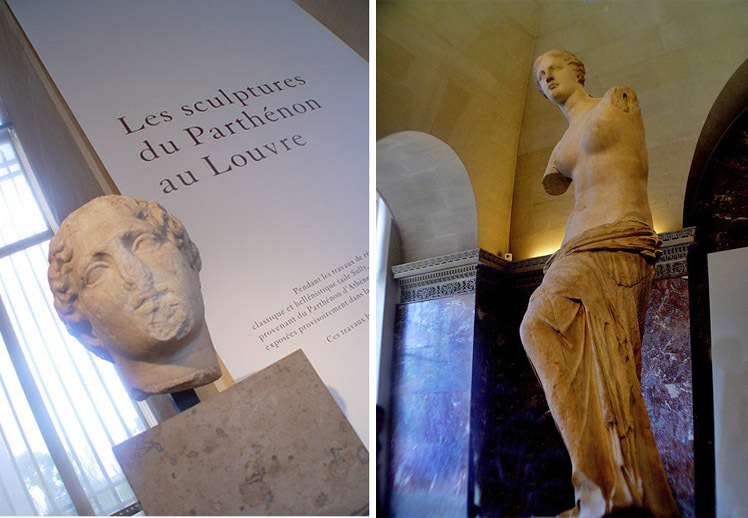 Scupltures from Parthenon and Venus de Milo, famous for missing arms and hands. One spectator said that it was perhaps during transport, that the hands of the statue got lost. I jokingly said Hercules threw a discus and accidentally destroyed the arms…referring to the Disney movie, Hercules. =D Kidding aside, here’s what really happened. Niké (image below) is also called the Winged Victory of Samothrace. It is one of the surviving masterpieces of Hellenic sculpture despite its significant damage. Believed to date from 220-190 BC. This sculpture stands at the Daru staircase, which is the perfect spot for such a work of art. The Mona Lisa. Perhaps the most famous painting in the world, a portrait by Leonardo da Vinci of Lisa Gherardini, wife of Francesco del Giocondo, that has been finally established as a fact just this month. The La Joconde has been subject to many critics and research and at one time; a robbery. Thus, it has been displayed at the museum’s Salle des États inside a purpose-built, climate-controlled enclosure behind bullet proof glass. 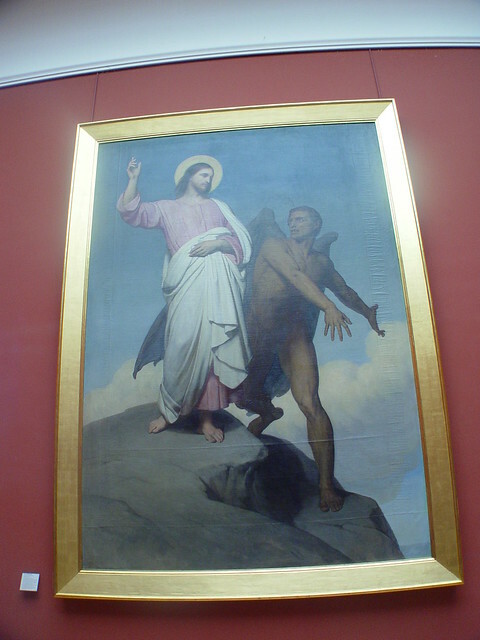 A wooden rail prohibits the viewers from coming too near the painting. But the guards were so kind to have let us go past it, really thankful! This could be of Roman origin. 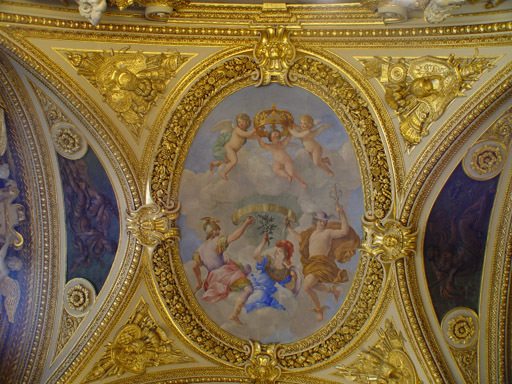 The most extensive royal abode I visited with gold plated on wall edges is Vienna’s Schönbrunn Palace, its ballroom’s ceiling is also painted but without gold in it so I was in awe at this display…I sadly forgot now where this one actually came from. 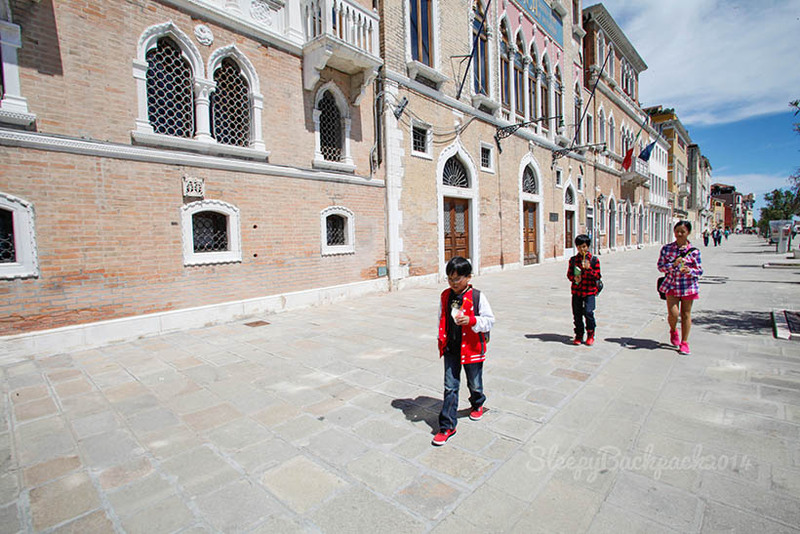 ^Taking a rest from the long walk as hubby takes more photos of the paintings on display. 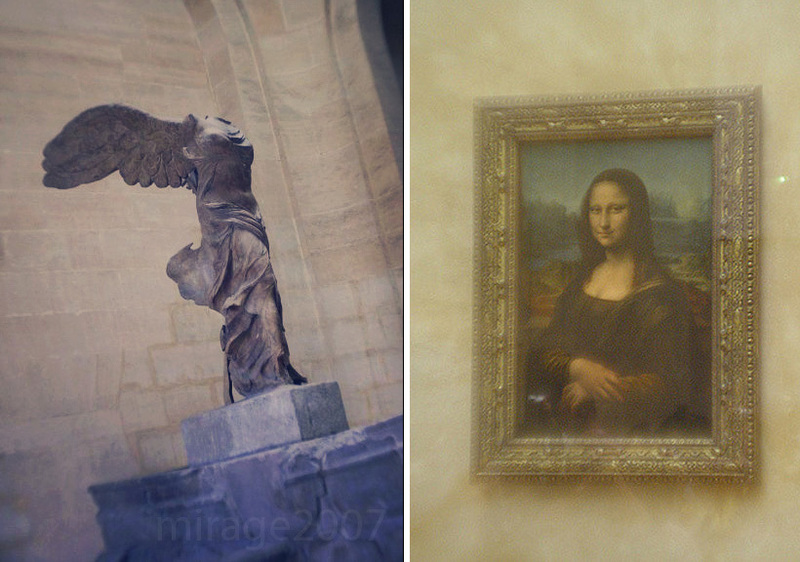 I do love walking around museums but the Louvre is just too big. You definitely would appreciate a minute or two of just sitting. 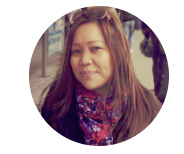 Buy Paris City Pass here (Free Admission + Travelcard). By the way, Jean Reno who played Bezu Fache in the movie Da Vinci code which was set at the Louvre, did a narration: the Da Vinci code soundwalk for the museum. The audio guide gives the listener historical facts and meanings of many paintings at the museum. 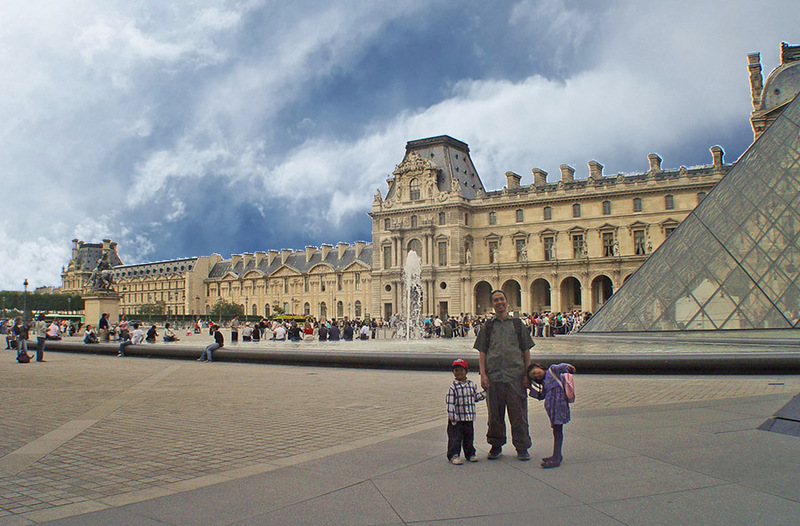 The Louvre is not just big…but really really big, we were not able to finish touring it. Half day won’t be enough for hubby, an artist and admirer of art and for me, an art lover who once dreamed of becoming an artist. 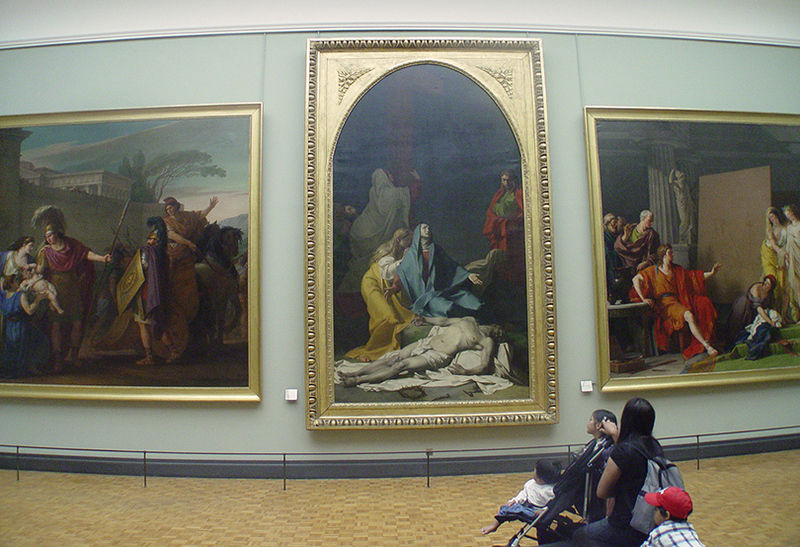 =P The Louvre is truly an art lover’s haven, no wonder it gathers as much as 8 million visitors a year!